One of the first vegetables to cheer up the late winter and herald the arrival is Spring, are (there is a clue in the name) Spring Greens. In Britain and Ireland, Spring Greens are, in fact, young cabbage plants and are incredibly tender and missing the hard, central core of cabbage which has grown to maturity. In this super-easy side dish recipe, the greens meet beans which bring a slight crunch of texture to the dish. The two are lightly steamed and then bathed in a ginger and lemon butter. The combination is sensational and makes a dish which works so well alongside fish, chicken and is so good; it can be eaten as a light warm salad with a little rocket (arugula) and spinach stirred through and a sprinkling of toasted pine nuts for extra crunch. Melt the butter in a small saucepan. Once melted pour the butter into a glass, heatproof jug and leave to stand for 5 minutes for the milk solids in the butter to separate. Pour off the golden, clear, butter and discard the solids. Pour the butter back into the pan, add the grated ginger, stir over a low heat, then add lemon juice a few drops at a time until you reach the desired taste - this is personal depending on how much you like lemon. Once you reach your desired taste, sprinkle lightly with sea salt and keep to one side. Roll the Spring greens into a tight bunch and shred with a sharp vegetable knife. Top and tail the green beans and rinse under cold water. Steam the beans over boiling water for 5 minutes until slightly cooked, then add the greens and steam for 3 minutes to gently wilted but not cooked through. Tip the beans and greens into a warm serving bowl and pour over the dressing. Toss the two together and finish with a few grinds of black pepper. This dish does not improve for keeping so make it last minute to get the maximum texture and flavors from the vegetables. 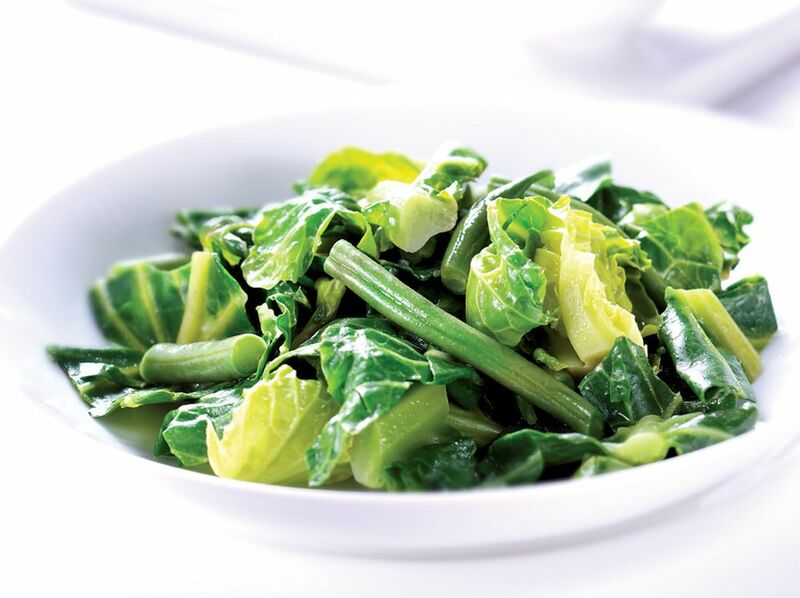 If you want to tweak the recipe, try the spring greens stir-fried in a little sesame oil. Again do this lightly, the beans should still be slightly crunchy and the greens only wilted not cooked through. Omit the ginger and serve with simple lemon butter. Sprinkle a little finely chopped red chilli into the dish before serving to give the dish a little bit of a kick and more oriental feel to eat - great for lightly steamed fish.